As I continue my endeavor to eat the meat I've accumulated in my freezer, I noticed I had some nice grass-fed beef shanks to cook. I polled my facebook and twitter fans/followers as to whether or not I should make Slow Cooker Grass Fed Beef Shanks and Cabbage Stew or Slow cooker Peppered Beef Shank in Red Wine. 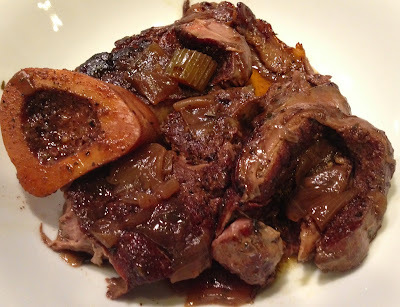 It was a unanimous vote for the Peppered Beef Shank in Red Wine from TheKitchn. If you've not visited TheKitchn before, its a great website full of cooking and entertaining information. After gathering my ingredients, I took to prepping this dish for the slow cooker. This dish has more than the usual amount of preparation work for a slow cooker recipe that I'm used to doing. I was willing to do it as I figured the end result would be phenomenal flavor. I started by putting the homemade beef broth in the microwave to defrost. Next, I washed and dried the beef shanks and put them on a sheet pan for seasoning. Before seasoning the shanks "generously" with salt and pepper, I put my 12" ceramic saute pan over high heat with 1 teaspoon of coconut oil. The recipe says to trim the fat away, but I really didn't see any extra fat to trim, so I didn't. Once seasoned, I added the shanks to my skillet. I discovered that only three of the 4 shanks would fit in my 12 inch skillet so I quickly heated my 10 inch scanpan for the fourth. I hate to dirty another pan, but I was preparing this in the morning before work didn't have time to do a second batch of browning. 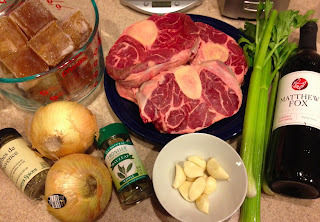 This is likely my fault as the recipe only calls for 2.5 pounds of beef shanks. I had nearly 4 pounds. I wasn't worried using almost double the meat as I knew it would all fit in my slow cooker and would be covered by the flavoring liquid. To be honest, it doesn't seem worth it to fire up the crock pot for only 2.5 pounds of beef shank to me. The recipe calls for the shanks to brown for at least 7 minutes per side. I set a timer and started to prepare the vegetables for the dish. I washed and sliced the celery into about 1/2 inch pieces, chopped the garlic, and chopped 2 yellow onions. I took pictures of this, but they were really boring pictures, so use your imagination. Make sure to turn your exhaust fan on high and perhaps open a window or door as it will get smoky as the meat browns. This may be a redundant picture, but every time I use my scanpan skillet, I am so impressed by its performance. I use my 12" ceramic deep saute pan more than I do this scanpan skillet but that's only due to size. Look how well the scanpan browned this shank. It's just beautiful. After the shanks had spent a full 14 minutes browning (7 min/side), I added them to the slow cooker crock. 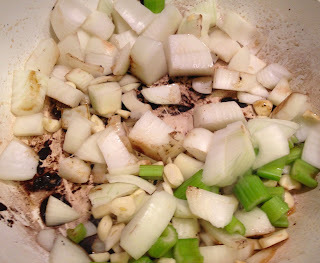 I turned the heat to medium and added the garlic, onion and celery to my 12" ceramic skillet. And sauteed them for 15 minutes as stated in the recipe. I stirred the vegetables occasionally. The recipe calls for a sprig of rosemary. I didn't buy fresh rosemary as I figured I had dried at home and that would do. It ends up that I do not have dried rosemary in my pantry. Oops. This actually isn't too surprising as I tend to not like rosemary. It tastes like soap to me. I did have Herbs de Provence. The Penzey's blend I used lists rosemary as the first ingredient; and therefore, supposedly, the ingredient with the greatest volume in the blend, so I felt this was a fair substitute. I added one tablespoon of Herbs de Provence to the vegetables and a bay leaf. And here is the best part of the preparation of this recipe. 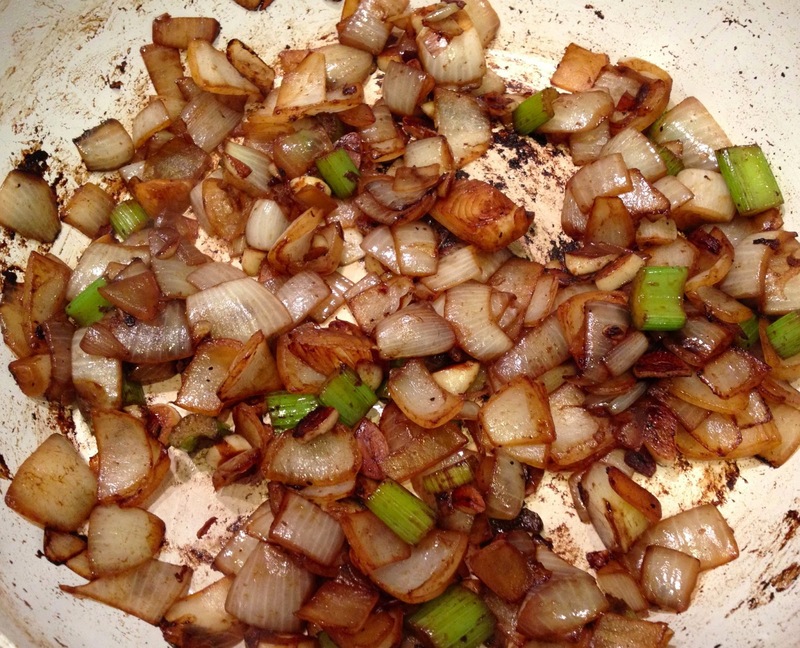 You pour an entire bottle of Cabernet Sauvignon into the pan with your vegetables. If you have not smelled the aroma of an entire bottle of wine simmering on your stove, you need to find a recipe that calls for it, perhaps not this one, and do it. I then added 4 cups of homemade beef broth and 1/2 tablespoon ground pepper to the pan. For a recipe entitled "peppered beef shank" there isn't really all that much pepper in the recipe. I brought the wine and broth to a boil and then let it simmer for 20 minutes. After 20 minutes, the sauce had reduced. I'm not certain if it reduced a full third in volume, but if you look at the next picture, you can see the high liquid mark showing the original volume. I frankly didn't have time to let it simmer longer to reduce further, but I think it was fine. 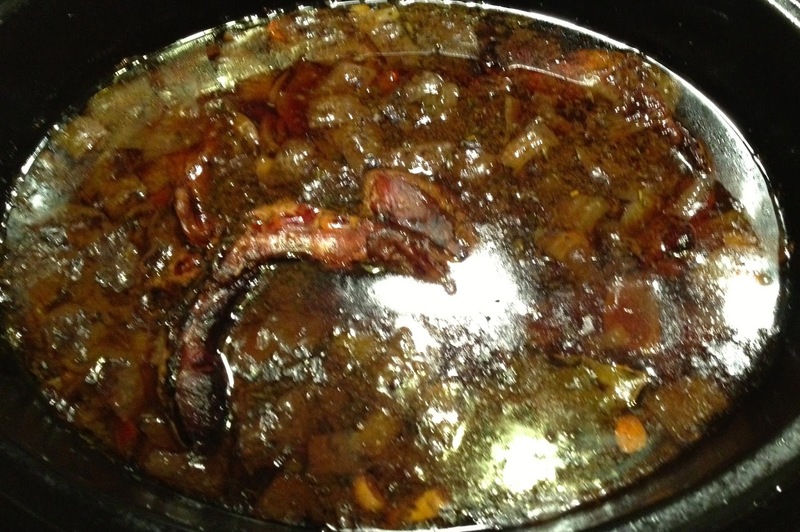 I poured the red wine sauce over the beef shanks in the slow cooker crock. I put the lid on and set the crock pot to cook on low for 8 hours. When I returned home from work, the slow cooker had been on standby/keep warm for 1 hour and this is what the dish looked like. Before touching the meat, I had to have the marrow. Accessibility & Cost of Ingredients: I know my "big box" grocery store carries beef shanks, but for some reason I question their quality more than I do other cuts of conventional meat. The shanks I used were purchased at Whole Foods. Since I pulled these out of the freezer and I had put them into a foodsaver bag, I can't say exactly what I paid, but I believe they were either $5.99 or $6.99/pound. 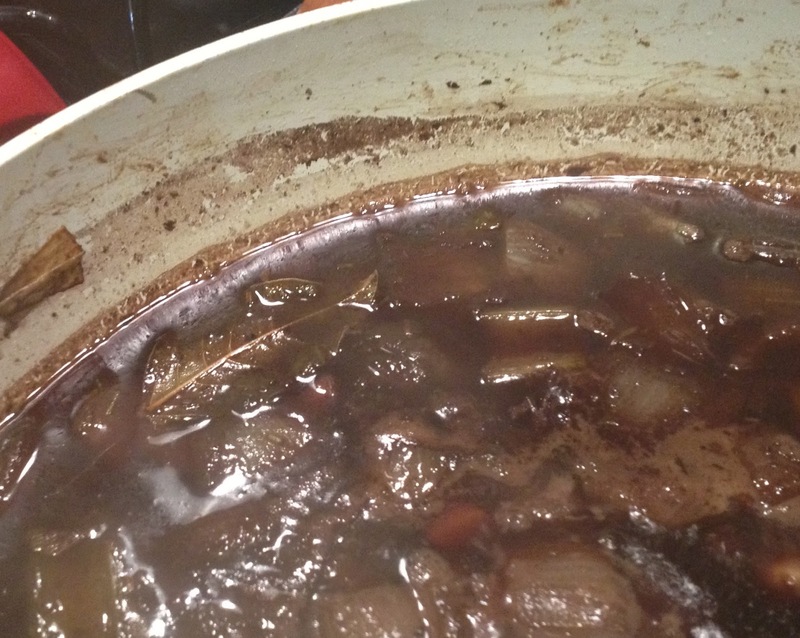 The recipe calls for inexpensive red wine like two buck chuck. There isn't a Trader Joe's in Austin, yet, so I chose one of the least expensive Cabernet Sauvignons at the grocery store for $4.98. You should be able to find the rest of the ingredients fairly inexpensively at your "big box" grocery store. Preparation & Cooking Time: This recipe took 1 hour 6 minutes to prepare before turning on the slow cooker for 8 hours on low. Clean Up: Despite the extensive preparation and my having used 2 pans, the clean up wasn't terrible. I hand washed both saute pans (and you may only have one if you only use 2.5 pounds of shanks) and wooden spoon. I pre-scrubbed the slow cooker crock before running it through the dishwasher with my cheap knife, cutting board and sheet pan. 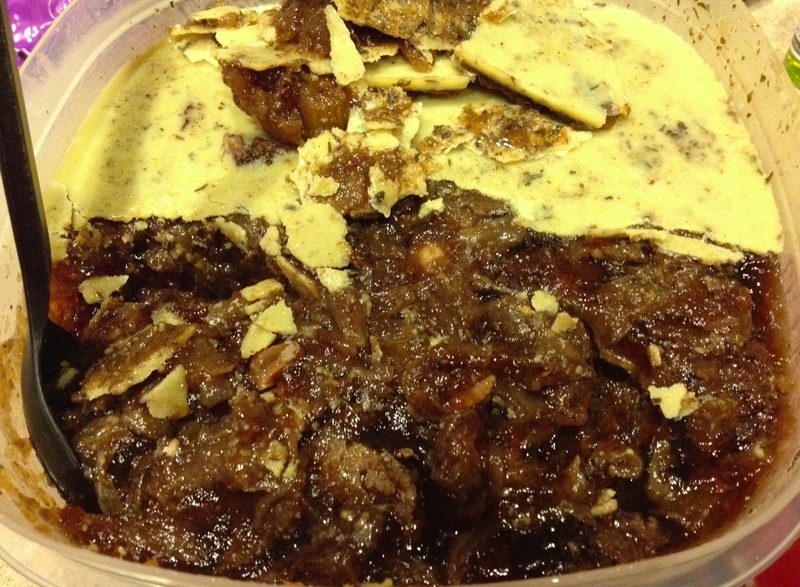 The Paleo Review: Thumbs down, mainly for lack of flavor and preparation time. The shanks fell apart as I removed them from the slow cooker, but they were not nearly as tender as I expected them to be. The shanks tasted good, but they did not have near the flavor I expected after investing all of the preparation time before slow cooking. As I suspected, they weren't all that peppery either. Could I have needed to add more Herbs de Provence and would the sprig of rosemary have changed this dish significantly? I don't think so. I know rosemary is a pretty potent herb and I could have probably added more Herbs de Provence, but where was the depth I expected from reducing the wine and broth? With over an hour of preparation time for a slow cooker dish, this was disappointing. I wont be making this dish again. The best part of this recipe was the bone marrow. 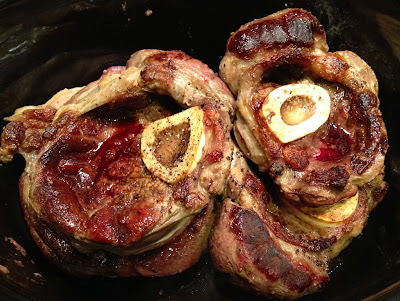 If I'm going to spend any considerable amount of time in the kitchen, I'd rather make these beef shanks (oh my goodness my reviews have improved). Does the flavor improve overnight? No not really. If you are planning to portion and freeze this recipe, I recommend that you do so before letting it refrigerate over night. Once it does, the sauce becomes gelatinous (*happy dance for bone and joint health*) and it becomes difficult to pick out meat from sauce. This picture is also good as it shows that there really wasn't much extra fat in this dish. The layer that formed on top was very thin. This just shows that when selecting a slow cooker recipe, not all are dump and go and putting the extra time in doesn't always guarantee flavor. Do you have any favorite beef shank recipes?